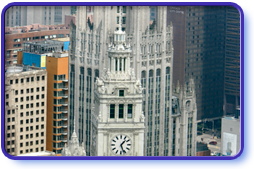 The Chicago Tribune building, (background) graces the skyline along with the Wrigley Building (foreground). The Wrigley Building was Chicago's first air-conditioned office building. From the Rookery to the Columbian Exposition to his visionary Chicago Plan, Burnam elevated the way we look at Chicago. The first to look skyward for prime real estate. Champion of skin and bones architecture, he believed: "Less is more." He designed 45 Chicago buildings that the world imitated. He coined the phrase, "Form ever follows function," and is known as a father of the "Chicago School." Oak Park's favorite son and founder of the Prairie style designed more than 150 buildings from his Chicago studio.